I know many of us are challenging ourselves to chant more than ever...aiming towards November 18th and the opening of the WorldWide SGI headquarters. I wrote this a while ago and repost it from time to time. When I first began chanting a leader told me our lives and our karma can be compared to a glass with dirt at the bottom...the dirt represents the karma that exists inside our lives. She said when you start to chant you stir up that dirt and see it swirling around...and if you want to really dig deep and clear it out, you might want to chant for a really long period of time...to do a Daimoku Tozo as we call it. A reader requested I share some ideas about chanting joyfully, especially since so many of you are challenging yourselves to chant for longer periods of time. Thank you for asking. 1. Realize that what you are about to do...an extended chant...a tozo...has profound significance for your life. Give yourself credit for this worthy goal, and set a chanting time goal for yourself. "I am determined to have the most beautiful, loving relationship so that I can totally inspire other people that great relationships are possible ...I can show actual proof with my life, and be able to introduce others to this practice!" 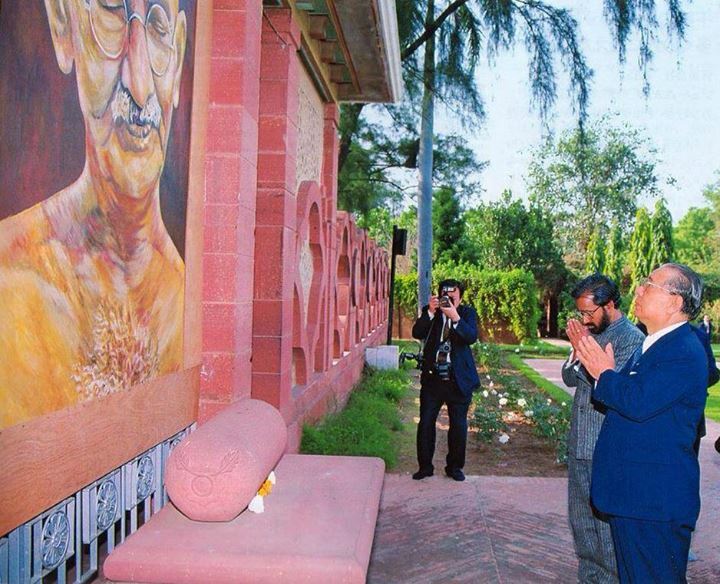 In one of the tozos I chanted, I'd read President Ikeda's guidance saying you can chant to have 10,000 times more power in your prayer. So I spent the first hour chanting to increase the power of my daimoku by 10,000 times! That hour flew! 4. DEMAND your results! 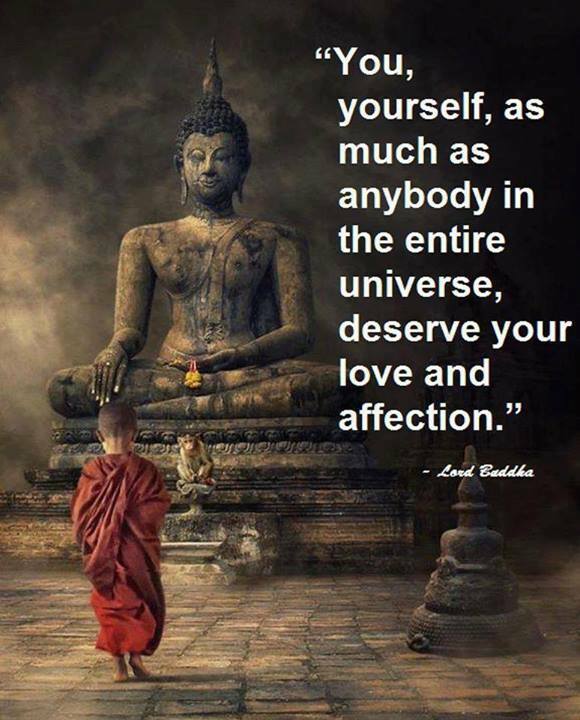 YOU are the Buddha! Do not beg favors from a 'higher power." Remember the Gohonzon cannot get down off the scroll and do the Buddha's work in the world. YOU actually are the Gohonzon; it is inside your life. The scroll is a reflection of the highest life condition that exists within your own life. So when you are chanting CLAIM what is yours! Yes, the Gohonzon consists of the functions in the universe that are in our lives. Tell your life what you want. And know that all real change comes from within. 5. All change comes from within. Take responsibility for your life...not blame. Realize whatever you are going through, whatever is causing you to chant...it's your karma..not your FAULT. 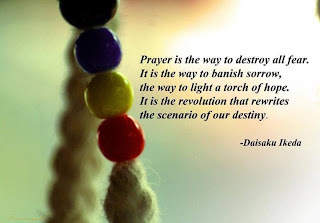 Chant to reach the very core of that karma and change it forever. THEN your life circumstances and environment will change to reflect it. You don't have to figure out the deeper cause, don't worry about getting it right. Chanting is experiential, not an intellectual exercise. 7. Invite others for all or part of your tozo. 10. After the tozo write in your journal. You never want to forget this day. Write to me too. I love to hear your successes and your challenges. 11. Expect some obstacles to arise after your tozo. And just say "Hello obstacles! I was expecting you!" When you chant for an extended time you can compare it to turning your speedboat to HIGH. The faster you go, the more resistance you feel. Sometimes after a tozo I experience some obstacles, sometimes I don't. But if you do, please remember obstacles are fuel for your happiness and not to be feared. Face them and chant them away. I am chanting for you to accomplish your goals and shine with happiness! 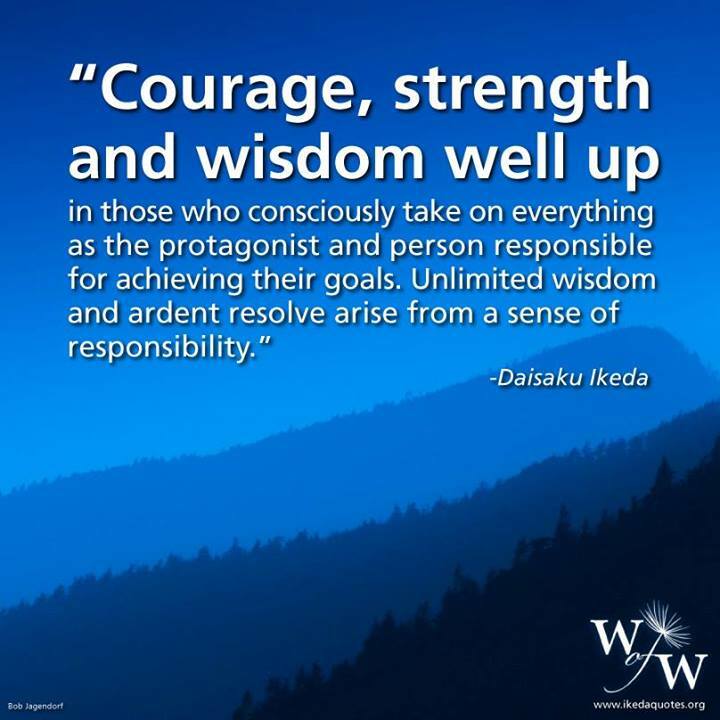 I am chanting for you to connect with the SGI and President Ikeda and all your Soka Gakkai friends. From “The Third Day of the New Year” (WND-1, 1013). "Those who make the best possible causes in their lives through working for kosen-rufu will never fail to enjoy immeasurable good fortune and benefit. Such are the workings of the law of cause and effect in life. 1. Get some exercise! Walk if you can. Fill your lungs with air, and oxygenate your body. It is always amazing to me how my mood is affected by moving my body. Yoga is great too. Find something you love...dance...run...whatever makes you feel great! 2. Drink lots of water. I drink about 100 ounces of water a day. It helps me in so many ways. I feel so much better. I take out four 24 ounce bottles and put them on my counter and make it a goal to drink them all each day. 3. To keep myself from anxiety I stay away from most forms of caffeine. Your body may handle caffeine just fine. But if you have anxiety I recommend cutting out the caffeine for a few days and seeing how you feel. I do drink tea. 4. Take loving care of your body. Get a massage. Massage is healing. It literally helps to drain the toxins from your body. And get enough sleep! Studies are coming out every day about how important sleep is to overall health, mood, even weight loss. 5. Take your vitamins. I found a reliable person to help me understand what my body needs, and I follow the regime. I take a lot of vitamin D3. I can feel the difference if I don't take it. Even if it's sunny I need my Vitamin D! 6. Chant as much Daimoku as you can. I know sometimes my voice gets tired and raspy. But I am keeping up my two-hour a day campaign. I have to. I am skyping with friends all over to chant and get and give support. 7. Study Buddhism to get perspective and re-fire your faith. When you are studying you can tap into your deepest and most powerful prayer. 8. Laugh! Have some fun with your friends. Make room for spontaneity. This week I ended up on a sunset boat cruise on Lake Michigan viewing my favorite skyline with the sun going down behind it, and the lights of the city coming up. Truly a magical moment. Or watch something that makes you laugh. Most of us have heard about Norman Cousins who healed himself of cancer by watching old funny TV shows. Laughter fills your body with oxygen. 9. Be grateful for all you DO have. When I am really stressed I write down all the things I am grateful for...my eyes, my ears, my sense of smell, the fact that I can walk, and sleep, and all my close friends. 10. 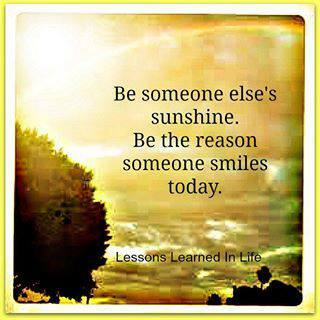 Do something for others. Doing shakubuku is the highest cause you can make for your own happiness. 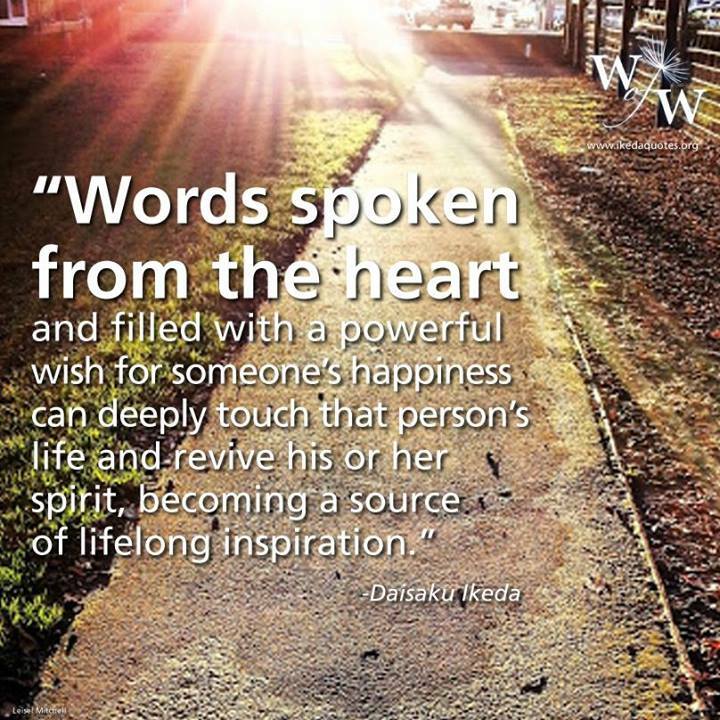 Give out Nam-myoho-renge-kyo cards, invite people to your house to chant. Call up a fellow member and say "How are you?" Of course, chanting a lot of daimoku is the cornerstone to handling stress, but the other things I mentioned here are also important to me. I hope they are helpful to you. Here we are chanting in the Worldwide Million Daimoku Campaign. Many of you have emailed me saying you have huge goals, and are chanting 300 hours (a Million Nam-myoho-renge-kyos) to make them happen. You know what that means, right? YES! It means that your karma, my karma, all of our karma will come out so we can change it forever through chanting nam-myoho-renge-kyo. Although this is really the best, most invigorating way to live, it can also be daunting. 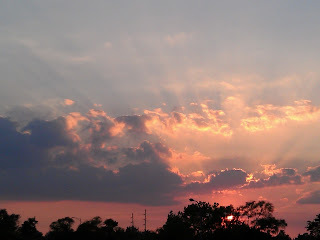 Today's post is from my heart, because I am totally sharing in a great challenge in my own life. Many of you write me facing Huge challenges...HUGE CHALLENGES. As you know, I love hearing from you and am always happy to answer your emails that you send to chantforhappiness@gmail.com. I am now offering chanting coaching over the phone or skype. You can tell me what is happening in your life and I will really hear you. I can help you write your own personal PowerPrayer, and move your life forward with new courage, vigor and determination. 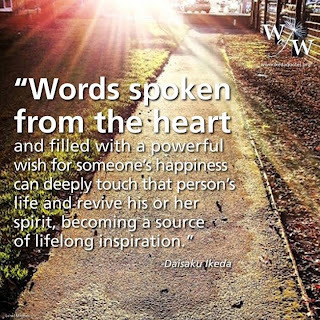 If you are interested in finding out more about speaking with me personally, please send me an email at chantforhappiness.com. Whatever you are facing ~ YOU have the power to change your situation. It starts with chanting to do your own HUMAN REVOLUTION. Your life is the shadow of your inner life. 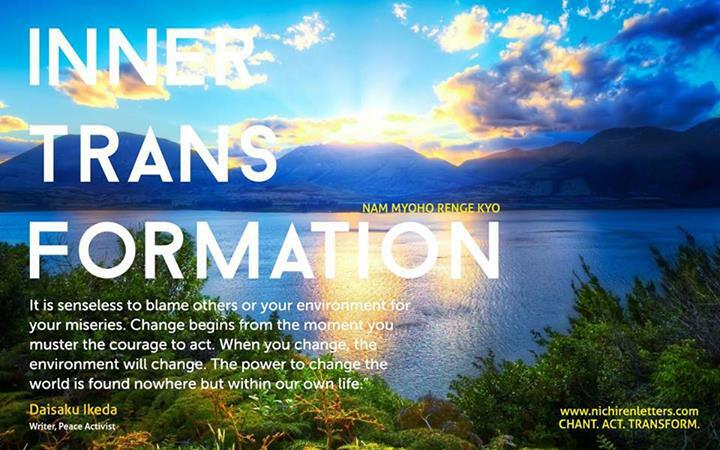 When you change your inner life, you will also change the shadow ~ your whole environment will change. This will absolutely happen. I think of karma as being in the garden hose of life...the water is coming through the hose, but it also has mud and dirt in it. As the dirt (karma) washes out through Daimoku, sometimes it gets clogged with problems, and that's when I have to chant more, study more, chant with others more, do shakubuku more and challenge myself more to change my karma. I can't give up. No problem is bigger that Nam-myoho-renge-kyo! Let's not give up! I know I can use my victory over this problem to inspire others and build my own unshakable faith. I MUST use all the resources of my faith, my mind, my courage and my compassion to light the way for all of us. When you have this sort of feeling, that "I, _______(your name here), will overcome ALL my suffering and use my experience to inspire others" your feeling of suffering will change. You will understand and challenge your life in a new way. You will chant with more strength in front of the Gohonzon! See if you can do this! You must generate and create the conviction that you are suffering for a greater purpose: to help others, and that you WILL achieve victory so you can inspire others. And your suffering will end immediately when you grasp that you have a deep mission. 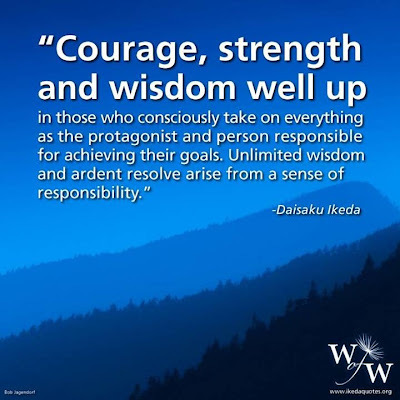 But we are not here to master suffering, not we who practice Nichiren Daishonin's Buddhism with our mentor Daisaku Ikeda! We are here to master happiness! And forging courageously through our suffering, and using it as the fuel to create our happiness...that is the highest and best state of life. We are so lucky to be able to chant to overcome our problems! We can change everything! We can't back down. We must make strong determinations! We have to go the distance and say "No matter how long it takes...I WILL change this! I am THE BUDDHA! I AM NAM MYOHO RENGE KYO! NO devilish function, no "bad karma" can defeat me! No WAY! "Nam Myoho Renge Kyo is like the Roar of A Lion - What Sickness Can Therefore be an Obstacle!" never to discard faith will receive the protection of all Buddhas. WHILE controlling your mind, which is both extremely subtle and awesomely profound, you should strive to elevate your faith with freshness and vigor. When you do so, both your life and your surroundings will open wide before you, and every action you take will become a source of benefit. Understanding the subtle workings of one’s mind is the key to faith and to attaining Buddhahood in this lifetime. THE actions we take for others, for the Law, for society and for kosen-rufu ultimately bring blessings to our own lives. To the extent that we exert ourselves in this way, our lives become polished. We become like magnets, drawing benefits into our lives. People who continue to chant daimoku throughout their lives, naturally become a “cluster of fortune and blessings” themselves. IF you fall down seven times, get up on the eighth. In other words, do not give up when you feel discouraged, just pick yourself up and renew your determination each time. WE have truly entered the age in which the great philosophy of Buddhism will lead the world. Many thoughtful, discerning leaders around the globe are focusing intently on the wisdom of Buddhism and enthusiastically endorse the humanistic principles upheld by the SGI. Let us proudly work to expand our network dedicated to bringing peace to the world through the propagation of the correct teaching of Buddhism. I am not unmindful that some of you have come here out of great trials and tribulations. Some of you have come fresh from narrow jail cells. And some of you have come from areas where your quest for freedom left you battered by the storms of persecution and staggered by the winds of police brutality. You have been the veterans of creative suffering. Continue to work with the faith that unearned suffering is redemptive. Go back to Mississippi, go back to Alabama, go back to South Carolina, go back to Georgia, go back to Louisiana, go back to the slums and ghettos of our northern cities, knowing that somehow this situation can and will be changed. PowerPrayers for Busting Through Obstacles! TWO PowerPrayers today! 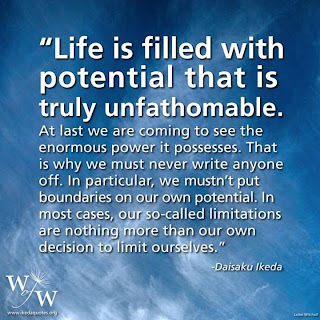 Those of us who are challenging our lives through strong Daimoku (the chanting of Nam-myoho-renge-kyo, which means "I fuse my life with the mystic law of cause and effect through sound vibration") are summoning up obstacles in our lives. This is part of the practice and part of life. As I've said many times, we can use these obstacles to FUEL our lives and our happiness, and provide us with the fire to change our karma forever, or we can have these obstacles FOOL us into thinking we are not strong, not capable and not wise, and give up. Recognizing Obstacles for What they are! give way to each other. when an ordinary person attains Buddhahood. and the wise will rejoice while the foolish will retreat. 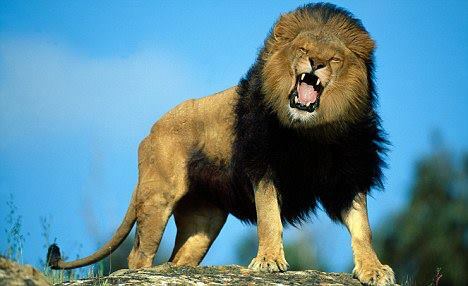 and I am roaring like a lion. through my Daimoku I make you my ally, instead. every day until I have ultimate victory. and by my strong faith while facing this challenge! of being abused by anyone or any thing! No more struggling in a job I hate, or any other terrible situation. How is Our Practice Different from the "Law of Attraction" or The Secret? I received a question from a reader asking how our Buddhist practice is different from the law of attraction, and wanting more clarification about the Gohonzon. I am very familiar with the law of attraction. I have read the Secret and I attended many talks by Abraham (Esther and Jerry Hicks) and I DO believe that what we focus on is very important. We need to focus on what is positive, and what we want to bring into our lives. 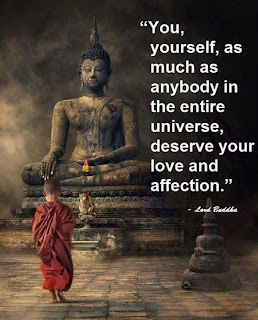 The thing the Secret is missing is any recognition of karma, and a consistent practice to elevate each person's vibration. Every day, by chanting, we elevating our life-condition. We intone the rhythm of the name of the universe itself, Nam-myoho-renge-kyo, meaning: I fuse my life with the mystic law of cause and effect through sound vibration. Let's face it, some things are easier to change than others, right? For some things you can just focus on them, watch how others are accomplishing them and just make the change and make it happen. Other things, well...they could take years; they are more embedded karma, but they CAN be changed with this practice. When we chant we are chanting to our own life, our own essence, our own Buddha nature. We don't chant to Buddha! We chant to our own highest selves...deeper than our subconscious minds...the part of us that is connected to the whole universe. It is, of course, impossible to explain and must be experienced. If you are reading this blog and haven't experienced chanting you need to chant to feel it. When I started, I chanted 5 minutes every morning and 5 minutes every evening, and I went to SGI meetings to learn more. I had a "seeking spirit" and felt I was onto something. 28 year later I am still "onto something" and live my life to help others tap into the power within themselves. When we live this way life is an incredible joy...and all our problems FUEL our happiness! To find a meeting in your area, click the SGI Portal on the right. 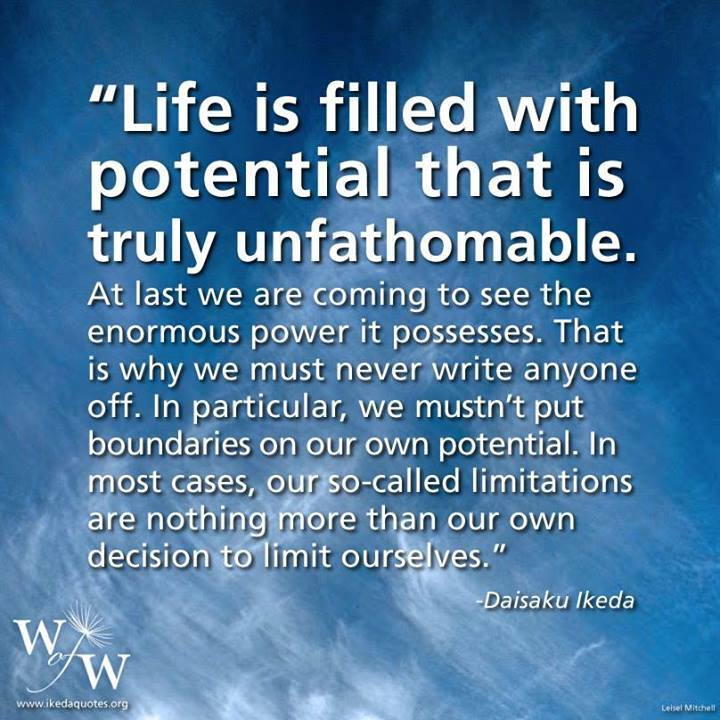 This is one of the many speeches of Daisaku Ikeda I read over and over again. We are truly microcosms of the macrocosm of the Universe. 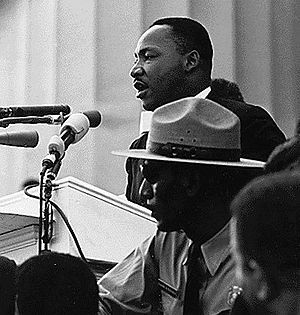 This speech resonated for me. It also corresponds with the blog from a few days back comparing the irises of our eyes with the nebulae in the universe. Enjoy! I would like to take the opportunity provided by today’s training session of the youth division to present a succinct and easily comprehensible discussion of the significance of gongyo. Because of the limitations of time I cannot pursue the subject in all its details, so I would like all of you to consider and explore this topic on your own afterwards as well. Through that practice we can acquire wisdom and good fortune, and glow with the energy to overcome any obstacle throughout the four seasons, three hundred sixty-five days a year; we can enter the way to the eternal happiness and attain eternity, joy, true self and purity (jo raku ga jo). Gongyo is a practice which calls forth and activates the infinite power that the microcosm inherently possesses. It transforms your fate, breaks through any apparent dead end and converts sufferings into happiness. It creates a transformation, a revolution of the microcosm. It is a diagram in miniature of kosen-rufu in our lives. Gongyo and chanting daimoku are like starting the automobile’s engine every day and driving in the direction of happiness and truth. Even though we may experience a period of sadness or depression, the principle that earthly desires are enlightenment teaches us that great sufferings are bound to be transformed into equally great joy, progress and value. There is nothing to fear, since the Gohonzon possesses the infinite power of the Law and the Buddha. My message to you is that you must be absolutely certain of this and live your wonderful lives without regret, with joy and brightness, always moving forward. "This Gohonzon is the essence of the Lotus Sutra and the eye of all the scriptures," Nichiren Daishonin states. 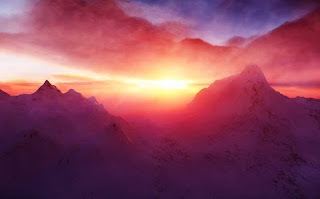 "It is like the sun and the moon in the heavens, a great ruler on earth, the heart in a human being, the wish-granting jewel among treasures, and the pillar of a house" ("On Upholding Faith in the Gohonzon," The Writings of Nichiren Daishonin, vol. 1, p. 624). In the center column of the Gohonzon are the characters "Nam-myoho-renge-kyo" and under that, "Nichiren," surrounded by various other Chinese and Sanskrit characters that depict historical and mythological Buddhist figures. Together they represent profound philosophical principles and conditions of life. Like a musical piece or a painting that reflects the life-state of the person who created it, the Gohonzon reflects Nichiren's life-state: Buddhahood. It is not merely a symbol, or something to focus on while chanting. Since it embodies the state of enlightenment, Nichiren's life, it is the actual reality of the Buddha's life. It is the link between the Buddha state within ourselves and in the environment. It is an instrument to see our true potential and use it. Therefore, by chanting Nam-myoho-renge-kyo to the Gohonzon, we call forth our own Buddhahood, tapping our inherent wisdom, compassion and life force. Gradually, day after day, our own life-state is influenced and strengthened through our daily practice to the Gohonzon. 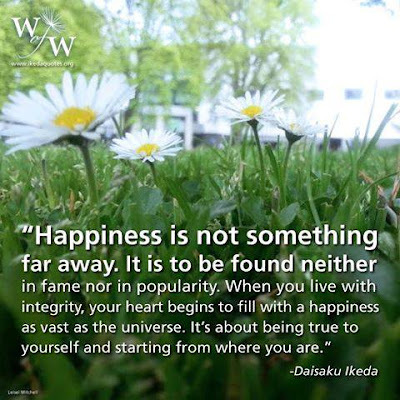 SGI President Ikeda states, "Just as a mirror is indispensable for putting your face and hair in order, you need a mirror that reveals the depths of your life if you are to lead a happier and more beautiful existence" (My Dear Friends in America, p. 94). Nichiren cautions: "Never seek this Gohonzon outside yourself. The Gohonzon exists only within the mortal flesh of us ordinary people who embrace the Lotus Sutra and chant Nam-myoho-renge-kyo" ("The Real Aspect of the Gohonzon," WND-1, 832). In other words, our faith and practice make the Gohonzon an external stimulus to awaken our internal life of Buddhahood. The tree was huge, and I got really worried for a moment. My mother was away from home and father at work. PowerPrayer for Winning - No Matter What! something deep in my heart has changed. And I will not give up! I am absolutely going to make it happen!